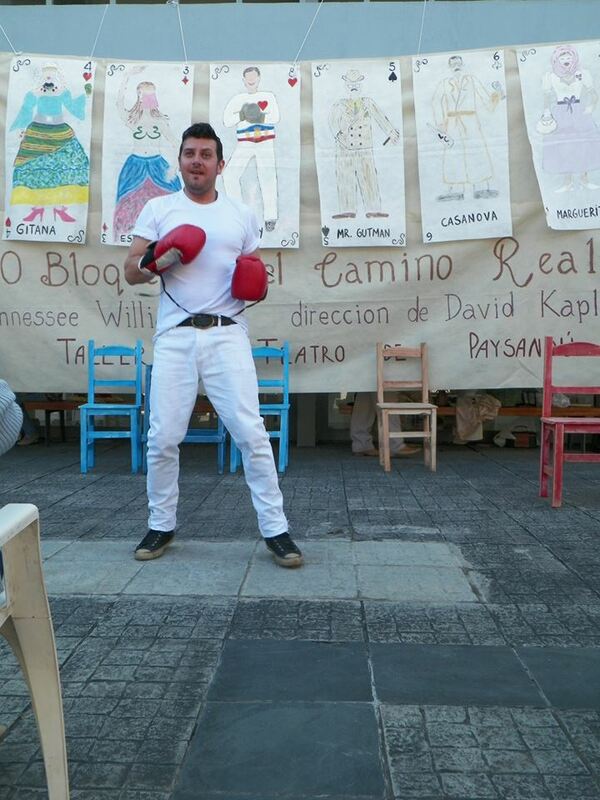 An outdoor production in the Paysandú marketplace, in 2012. Raul Rodriguez and his Taller de Teatro de Paysandú, Uruguay are quite special: a small company with a circle of students, led by a Russian-trained director and teacher. In practical terms that means the ensemble has the technique to work with with a combination of intermittent realism and Brecht’s ideas of story-telling, ideal for Williams’ Ten Blocks on the Camino Real – the short first version of the better known Camino Real. 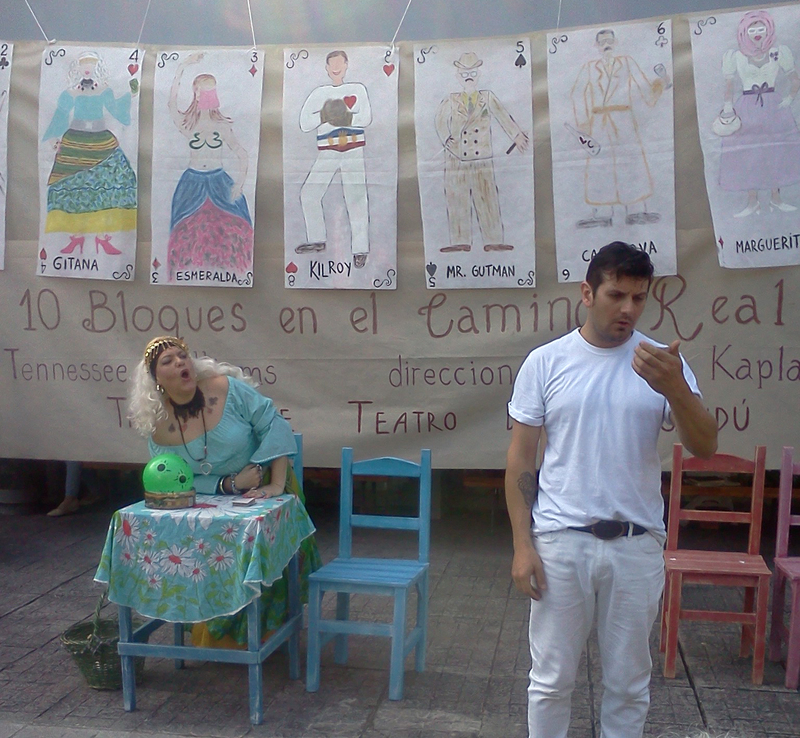 Ten Blocks was designed to be performed outdoors in marketplaces and premiered November 4 at the Biennial International Theater Festival in Paysandú. Posters of the characters hang from a backdrop with credits. The set before the audience arrives: 7 chairs, 2 tables. The blue furniture is for the Seven Seas Hotel, the pink for the House of the Gypsy, the unpainted furniture seats the Player of the Blue Guitar and lifts up the hotel owner. 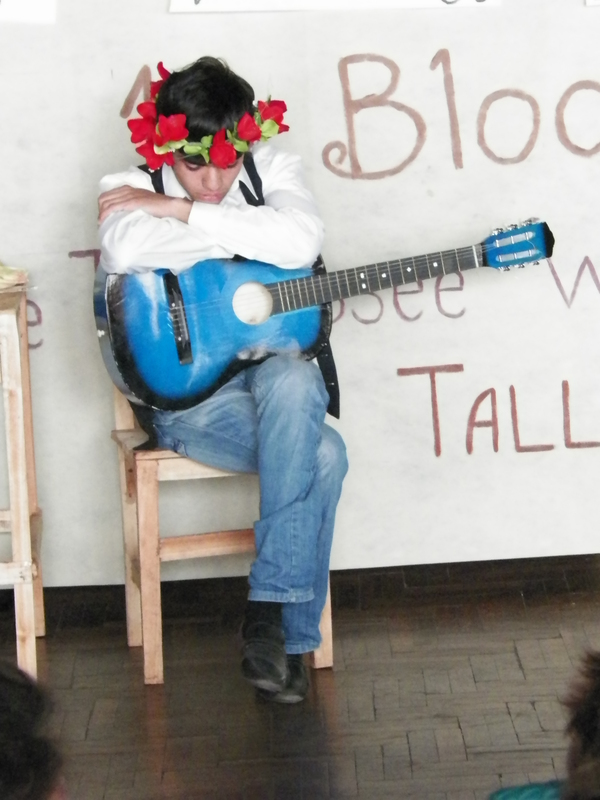 The play is performed in the Spanish spoken in Uruguay, which is softened by Portuguese. Doubles lls are pronounced sh as in shadow. The word for rain, lluvia, pronounced yuvia in Mexico is, in Uruguay, called shuvia. Below: Ilse Olivera as the Gypsy, Pavlo Col as Kilory Many of the props were children’s toys: balls, cards, a toy pistol. Don Quixote was the player of the blue guitar astride his guitar like a horse, wearing a triangular paper hat. See also the 2016 production in Ghana which built on these ideas.